Mirror-Mirror. Who’s looking back at you? I sat at an eyeglass store, waiting my turn with the optometrist after choosing frames. I needed a prescription for reading glasses. While looking around I got a quick glimpse of this frumpy-looking middle-aged woman, with windblown hair and a tummy bubbling out. She slouched in a chair as if she was at home in her pajamas. Thinking she looked familiar, I did a double-take and realized I did know her. That woman was me! A mirrored reflection of me. Imagine my jolt! Wait a minute! That is not the same person I saw in my home mirror earlier this morning? That person stood up straight, had neatly brushed hair and sucked her stomach in as much as it allowed. I sat up, fixed my hair and chided myself for looking so sloppy. The person I thought other people saw was nowhere close to reality. I then began reflecting on how this applies to the person inside me. I don’t give the same amount of thought to my inner image as I do to my outer image. My inner thoughts and attitudes also reflect in my outward person. Our behaviors and attitudes mirror who we are inside. Proverbs 27:19 says, As in water face reflects face, so a man’s heart reveals the man. Ouch! Scary, even. We have all been there. We’re in a heated conversation with someone, then the phone rings and we answer in a sweet, melodic voice, Hellow! Usually, the person we believe we are on the inside is not the person we outwardly portray or other’s see. Jekyll and Hyde reisides in each of us. Sure, we can stay in check if we really pay attention, but it’s hard work. We don’t always pay attention or like hard work. We blurt out anything that comes to mind, whether it’s careless, sarcastic, or rude. We behave in ways that are hurtful to others. 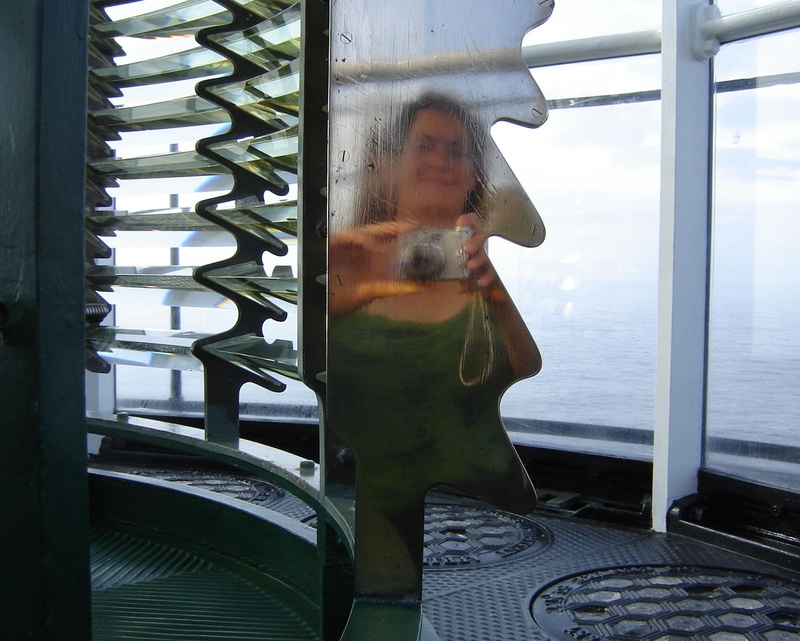 Often, we speak or act out reflecting the distorted view we have of ourselves due to past hurtful events, much like the photo above taken inside the lantern room of a lighthouse. It’s easier to be our true self than to keep a constant vigil over ourselves. I am the first person to admit I have a permanent foul taste in my mouth from all the times I have shoved my toes in. It really isn’t all that easy or natural for us to think first, then speak or act. That requires a great deal of control. Especially with our families. In Mark 6:4 Jesus says: “A prophet is not without honor except in his own country, among his own relatives, and in his own house.” The people around Nazareth, where Jesus grew up, were astonished, baffled by His wisdom and the miracles He performed. To them, He was just the son of the local carpenter. They judged His outward humanity, not understanding He was literally a Godsend. Mark 6:1-3 See also Luke: 4:24. Our family experiences an unguarded part of us no one else sees behind bolted doors. Jesus’ walk on earth was perfect, God in the Flesh. Everything He said was perfect and wise. We can never live up to His perfection on this earth. We can follow His ways and give it our best with the help of God’s grace and strenght. We must stay on guard and take a moment to think before we act or before the words rush from our mouths. Time after time, I have to ask God to shut my mouth before it takes control. For some time, God has been showing me I desperately need a heart-makeover. From God’s perspective, we all do; but this has been a distitnctive message the last few years. Sometimes, life comes at us at metro-rail-speed, forcing us to scramble to stay aboard. Then once things slow down and the dust settles, we have that chance to reflect on things, something that comes naturally as we age, if we’re paying attention. Well, that’s been my heart project for several years. Reflecting. I took a trip through Hindsight Valley, wincing and flinching at the countless mistakes I can claim. It has been much more unpleasant than catching an unwelcome glimpse at myself at an eyeglass store mirror or mall window reflection. This lethargically slow heart-makeover has ever so painfully begun to transform my attitude. A bad attitude is visible to those around me, just like that frumpy reflection. Mirrors don’t lie, well… some do. I have a mirror in one of my bathrooms that will boost anyone’s confidence. Really. This mirror makes anyone appear a whopping 20 pounds lighter. At first, I was drawn to it, until I figured out it had a deceiving streak. Now, those rare moments when I catch myself curiously drawn to the favorable reflection in that mirror, I know better. “I like that mirror,” my husband says, “I like thinking I actually look the way it’s reflecting. How do you know all the other mirrors aren’t wrong?” He’s half-joking, but I’m not persuaded. Seriously. No. That’s like stepping on an inaccurate scale, the kind you know full well is wrong when it displays your weight 10 pounds lighter, and you accept the number it displays anyway. There are miles left to my heart-makeover. Each day is a fresh start. It also carries new challenges that require us to keep a concious awareness of what comes out of us. Not surprisingly, as I worked on this article, my husand and I got into an argument, as most married couples do. I struggled to reign in my frustrated thoughts, yet some managed to escape. Thankfully, we get to live life only one day at a time.